AAA Mid-Atlantic wants people to know it offers more than just roadside assistance. Its assortment of products and benefits includes member discounts, financial services & insurance, travel & entertainment packages, and more. Pearson Education's website was underperforming. As the global leader in educational publishing, Pearson provides textbooks, testing, and curricula to students, teachers and administrators both in print and online. The usability and persuasive design of pearsonschool.com are critical to more than 100 million customers as well as to the company's business objectives. Pearson was deriving less revenue from pearsonschool.com than it projected, however, and metrics showed that users were not getting nearly as much from the site as they could. The site's lead conversion rate, page depth (how far into the site an average visitor went), and repeat visitation all fell well below the targets Pearson's e-Marketing department had set. At the same time, the number of single visits – visitors who did not come back a second time – was too high. "We were looking for data-driven approaches to help drive the next generation of the website," says Kevin Young, Director of e-Marketing. "I wanted to take a more scientific direction, making decisions on the basis of real data, rather than people with opinions. Because we had not been able to achieve substantial improvements with internal resources here at Pearson, we investigated a couple of other options – outside agencies that could bring a new perspective." Kevin brought in HFI, whose initial review showed a number of usability gaps that were preventing users from performing tasks. Users did not understand the site's content hierarchy, because it was not prioritized on pages. More significantly, it became apparent that the strategic design of pearsonschool.com did not properly address its full user ecosystem of teachers, administrators, students, and parents. Kevin and his team members saw they had their work cut out for them. "But with HFI's approach, we felt confident they would use testing and deep research to give us the more systematic, data-driven approach that we needed," says Kevin. Both phases of the project would require extensive research. To solve the site's most immediate user experience problems, and eventually create a powerful, holistic, online presence for Pearson Education, HFI had to throw out assumptions. HFI user experience specialists first asked: who are the site's users? What do they want? How are each user group's goals unique? And how do users interact with Pearson's site? Administrators want to put a curriculum in place, whereas a teacher needs to evaluate and approve a textbook. The student needs to do the assignment connected with the book – often online, rather than in paper form. 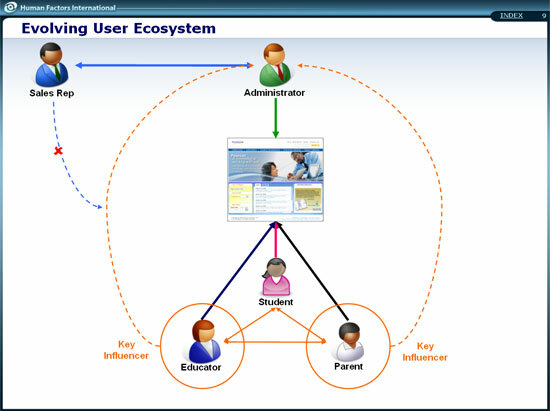 The parent's relationship with the student and the teacher is another element in Pearson Education's complex, dynamic ecosystem revealed by user personas developed and explored by HFI. HFI also interviewed a range of Pearson Education sales and marketing personnel to assess what Pearson Education's needs were. What did stakeholders hope to get out of the site? With priorities as varied as sales, branding, product management, and customer support, HFI helped Pearson Education identify common goals across different areas of the business. With user and stakeholder data in hand, HFI got down to the nuts and bolts of the tactical redesign, and began to lay the groundwork for enhancing Pearson Education's broader digital strategy with user-driven Web 2.0 features. Their approach: to ensure the site would Orient, Enable, Convert, and Support users throughout their visit. Orient – Do pearsonschool.com users know where to find what they need? Convert – Drive the customer's next actions through the clearly displayed value of products as well as access to purchasing tools. Support – Offer users a sense of exclusivity through membership benefits and special offers that create loyalty and drive decision-making. HFI's tactical expert review uncovered a number of issues that failed to orient users. The home page posed particular usability problems: it failed to clearly indicate the purpose of the site, the depth & breadth of Pearson Education's products, the value proposition offered for different user groups, or the overall structure of the site. HFI's recommendations centered on letting the users know where they were at all times. HFI's design revisions highlighted important categories and content and improved the visual hierarchy. A "What We Do" summary on the home page could orient users about Pearson Education's value proposition. Navigation shortfalls and a lack of visual clarity and continuity meant the site did not enableusers to find products or services. Inefficient search mechanisms, insufficient filtering capabilities, and inconsistent naming conventions threw users off the trail. HFI advised Pearson Education to enhance visual treatment and improve the page layout and structure for clear navigation, as well as, improve filters and categorize search results. They also showed Pearson how to write and format content especially for the Web. HFI found that Pearson Education was failing to convert users because of lengthy, multi-step processes involved in completing primary tasks. Product description pages were often dead ends. Without obvious next steps like adding to shopping cart, users often gave up. (And once in the cart, a confusing checkout process made products difficult to buy.) HFI provided across-the-board recommendations to speed up the shopping experience. They also advised Pearson to tout its impressive roster of star authors as a key value-add. Pearson Education was missing key opportunities to support users on its site. 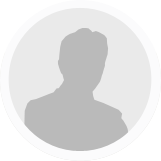 Returning users could not save their profiles or previous transactions; nor did the site feature the benefits of being a Pearson member – in fact, there didn't seem to be any. HFI showed Pearson Education how to join the Web 2.0 era with user-driven, community-building UX features such as message boards, book reviews, and tag clouds. HFI also advised Pearson Education to make product recommendations, wish lists, and purchase histories part of a package of attractive membership benefits. HFI went beyond page-level design to evaluate the general information architecture of the website, and determined that neither Pearson Education's customers nor its business objectives, were well served by it. They determined that pearsonschool.com was trying to present a few primary categories of content to a broad range of user groups with unique interests and priorities. HFI's strategy leveraged microsites aimed at user groups, such as educators and administrators, to focus Pearson Education's messaging, product presentation, and brand appeal. HFI presented its detailed, page-level redesign and architectural strategy in wireframes that enabled Pearson Education to make its recommendations concrete and actionable. 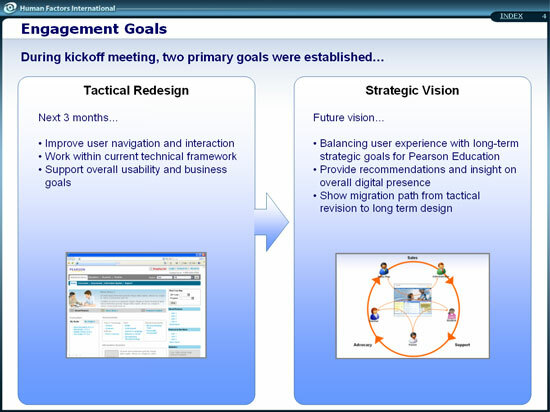 HFI's thorough, holistic visioning did not end at static designs, however. To give Pearson Education stakeholders a visceral, 360º sense of the new design, HFI also "storyboarded" the paths that administrators and educators would take as they performed a task. "The whole experience was great," says Pearson Education's Kevin Young. "We started broadly and worked our way more narrowly to specific problems. HFI did a good job explaining the site's capabilities and really tried to understand our business. They studied the problems we faced, helped us work through those problems, came up with the right research instruments, arrived at findings, and then translated those findings into something we could actually deploy." The effects of the initial tactical redesign were immediate. Metrics showed that page depth increased substantially, as users found it easier to go further into the site and find what they were looking for. Most significantly, revenue from the site is increasing as the number of users who progressed to shopping cart pages from curriculum category pages (e.g. math and reading) has almost doubled. Lead conversion is increasing, as well. "Things have worked out pretty well," says Kevin Young. "It was more than just redesigning the site. Our whole approach and site strategy has changed. HFI's four keys – orient, enable, convert, support – really resonated with us. The HFI team project- managed well, and in the end, I think that everyone here is really satisfied." Kevin admits, "We had to make some sacrifices on our side. That was a big challenge for us. However, our metrics are definitely going where we want them to, and that's clearly due to the redesign. Anecdotally, we have gotten a lot of positive feedback from key stakeholders." Kevin says the biggest challenge throughout the whole project was reconciling HFI's recommendations with Pearson Education's technical reality and their business reality. "For a variety of reasons," he explains, "we haven't been able to deploy all the recommendations yet – in a world of limited resources and budget, you can't get everything done at once." Pearson Education continues to work on other elements of the redesign as resources allow. "The analysis that HFI performed will be a key part of our strategy over time," Kevin says, as Pearson Education looks forward to building on the foundation of the tactical redesign. The company's next step is to use HFI's broader, ecosystemic recommendations to restructure their overall digital strategy. "I would without a doubt recommend HFI moving forward," says Kevin. "They really helped us to put a stake in the ground for the website. We are very happy."